On the first day of the show, Keba announced the acquisition of LTI Motion. With the acquisition, the company aims to evolve into a total solution provider in the industrial automation sector. Gerhard Luftensteiner, CEO of Keba AG (left) and Hartmut Braun, Managing Director of LTI Motion. 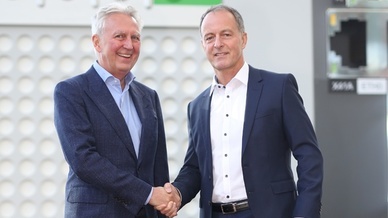 In addition to the servo drive technology manufacturer LTI Motion, the Austrian company Keba will also acquire the associated Heinz Fiege GmbH, which specializes in application-related spindle technology. A corresponding contract between Keba AG and the seller, Körber AG, was signed on November 15, 2018. The motivation for the takeover: "The portfolios of Keba and LTI Motion complement each other perfectly", explained Keba CEO Gerhard Luftensteiner. "Keba is a specialist in the field of control and safety as well as in operation in industrial environments, LTI Motion in the field of servo drive technology. The big advantage for our existing and future customers is that these competences are now bundled. They now receive complete solutions from a single source - from operation to control and safety technology through to drive technology, and all of this suitable for their respective industry." Keba and LTI Motion have been cooperating closely in the field of automation solutions for several years now. In the future, there will be synergies not only in technology and modular products, but also in sales. "Of course, we will use the synergies and the joint strength, but at the same time we will focus on continuity in the management of LTI Motion. It is important to us that LTI Motion's customers continue to receive optimal technological and personal support and ultimately benefit from the merger and the overall solution portfolio it generates," says Gerhard Luftensteiner. The Keba Group will grow from 1200 to over 1700 employees. The parties have agreed not to disclose the purchase price. The closing is expected to take place at the end of December 2018, depending on the antitrust law.